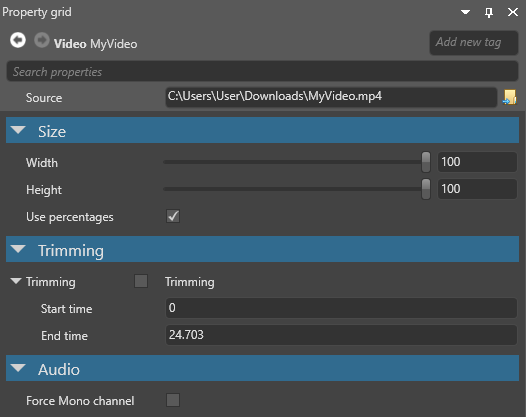 To view the properties of a video asset, select it in the Asset View and use the Property Grid. Width Resize the video width. The value is in a percentage or actual pixel size depending on whether you select Use percentages. Height Resize the video height. The value is in a percentage or actual pixel size depending on whether you select Use percentages. Use percentages Use percentages for the video height and width. If enabled, and the height is set to 100%, Xenko displays 100% of the video's actual width. If disabled, the height and width values use pixels, so you can stretch them beyond the video's actual size. Force mono channel Convert video audio to mono. This is useful when you want the video to use spatialized audio.